Babies — Morningside Day Out, Inc.
For infants between 6-12 months of age by September 1st. One teacher to groups of no more than four babies. May attend 1 or 2 days per week; parents may choose any combination of days, provided space is available. The beginning of wonderful preschool memories starts in our baby class (the "Sweet Peas"). Our babies are cared for by friendly, enthusiastic, and responsive teachers in a calm, soothing, happy environment. Their daily needs are met with smiles and frequent eye contact. Loving interaction between baby and teacher is given during diaper changes, feedings, and playtime. 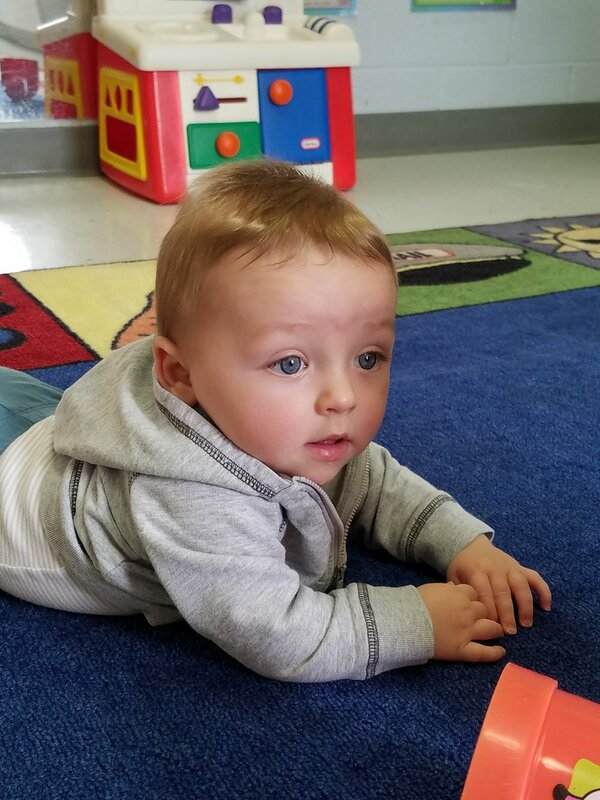 As baby’s physical and exploratory skills develop, the Sweet Peas classroom offers new challenges and discoveries. Our teachers nurture and encourage the children as they begin to communicate, crawl, and walk. They are talked to about what they are seeing and experiencing, encouraging language development. Music is played in the classroom and songs are sung frequently. There is plenty of cuddle time and each child is given lots of individualized attention. Your child’s happiness and comfort are our first priority as we provide them with a safe and secure environment. The first few years of a child's life are critical to establishing not only healthy brain development but also making important connections that will stimulate healthy overall development. Our “baby” curriculum focuses on making sure every aspect of the child is being considered. Begins to grab, pinch, bang, poke, twist, etc.